DR SHE BLOGGO: The Retro RBI Report: "Pilot"
Confession: I'm fascinated by television pilots. They're little christenings of shows, breaking a champagne bottle against a New Idea and pushing it off into the open seas of possibility. But - there are rules! Worlds have to be established, characters introduced, stakes set - and all the while piquing (and holding) the interest of the audience. Successful pilots are like little baby unicorns to me: they might be a little wobbly on their feet, but the fact that they exist is like a little miracle and I am basically transfixed by each and every one. The pilot is a foundation, a bedrock on which all future episodes are constructed - and if the pilot doesn't fundamentally work, very rarely will the show itself work. With a show like Glee, which has suffered its fair share of continuity issues and haphazardly deviated storytelling, it always is helpful to return to the original episode, the pilot, and see where it all began. And to be honest: the Glee pilot is pretty magical. In the span of 45 minutes, Ryan Murphy and Co. successfully constructed an entire world inside the halls of McKinley High - one in which we are intrinsically familiar due to the fact that it's, well, high school, and yet it's still a world which keeps us guessing. It's as if the showrunners are saying, "Here's this environment you think you know, but we're going to keep throwing you curveballs!" Let's look at character introduction for a minute: almost every character introduced in the pilot is done so first with a quick glance that only reveals a stereotype. Puck is tossing Kurt into the trash, and Kurt complains about his designer jacket. Finn's a dumb guy who falls asleep in school. We get a split second of Quinn cheerleading in slow motion, and the first glimpse of Rachel is when she spies on Sandy Ryerson and his chosen soloist with an infuriated, and, let's face it, half-deranged expression. The show puts forth their characters first with the expectation that we'll think we have them figured out, only to turn it back around on us later. Two characters specifically get this treatment in the pilot: Rachel, and Finn. Each of them get a narrated portion of the first episode, devoted to revealing their backstory and rounding them out as real people. We get a glimpse into Finn's past that he's almost forgotten, a past where he loved to sing and hang out with his single mom and her boyfriend from Emerald Dreams (until he left her for that girl he met at Pick N' Save). We get the idea that Finn's not just a dumb jock, and by the end of the episode, it's clear that he's going to be a key player in the show. As for Rachel, her segment comes on the heels of the glee club auditions, and it is a thing of beauty. It begins with a very put-together narration about her ambitions and future stardom, and references the fact that she got a teacher fired with a bout of dramatics (because she didn't get her solo, no less). We learn about her two gay dads, and we see a young Rachel tap-dancing with a slightly unhinged zeal as she alienates everyone around her. And we think she doesn't care! She has all the self-confidence in the world, with the way she stomps through the halls, speaks rather highly of herself, and intones every syllable of her narration with a very enunciated precision. But we also learn that Rachel Berry is not as put-together as we thought. As messages saying "please get sterilized" come in response to her MySpace videos, we realize that Rachel is supremely affected by the bullies at school, and at the exact moment that Lea Michele hits that glorious high note in "On My Own," she's slapped in the face with a slushie. This sequence is perhaps my favorite thing the show has ever done. It's so heartbreaking in its tone, and the way it's constructed is simplistic and genius. It starts with wonder, as Rachel steps into focus in front of the sign-up sheet, as we're meant to understand that this girl is special. The entire episode seems to slow down so it can pay attention to this force, and as Rachel yammers on, it transitions to annoyance, "On My Own" slowly fading out as until the MySpace regimen begins. And then it slams completely into tragedy as we witness Rachel's verbal abuse and the affect it has on her. All of a sudden we realize that she reeled us in with her crazy monologue, only to break our hearts with her crushed expression. And then the slushie. The slushie! The episode screeches to a halt as we drown in this ridiculous heartache. I remember watching the commentary for this episode and Ryan Murphy claimed that he re-edited the Puck slushie into the "On My Own" sequence because he got annoyed at Rachel Berry being so talented. I think he was joking. I hope he was joking. Because it's that slushie that hurts the most; just as the song reaches its triumphant apex, it's drowned out in a wash of wet ice. If the look on Rachel Berry's face as she read those comments weren't heart-shattering enough, it's that slushie - and the placement of that edit is the perfect cap on a sequence defined by unexpected realities. The main strength of Glee's pilot really does hinge on one of its own quotes: "There's nothing ironic about show choir!" Well, actually, there's a lot that's ironic about show choir, and the pilot is very quick to poke at those ironies. There's a lot of dialogue and story quirks that are included with a wry smile, as the audience is clued in on a joke that the characters don't get. We laugh at Puck believing that Finn's mom is having her prostate removed, and we laugh at the quick rack focus to the sign in Will's office that says "PRIORITY #1: HELP THE KIDS" as he's blackmailing Finn to join glee. Howard thinks dyslexia affects his sheet-folding problems, and Terri finds it exhausting to have to go home and cook for herself. Beyond that, the show mines a lot of material from the fact that they are setting a musical comedy in smalltown Ohio. How great is Darren from Emerald Dreams? And how much do I love that when he breaks up with Carole, she throws a jug of milk at his truck? But even though she's standing in the middle of the street wearing a denim vest and mom jeans, crying over a man with a mullet who picks up chicks at the Pick N' Save, I can't help but feel for her. There's something so delightfully oddball about grounding this show in Lima, Ohio and still managing to find an unaffected heart underneath the slightly mocking exterior. It's this use of irony and heart that ties directly into the way Glee originally built its world - by subverting expectation. It takes two concepts - like Rachel Berry's high note and a slushie to the face - and mixes them, creating a very specific cocktail of emotions. We laugh at these characters, but will eventually cry with them. It's a difficult ruse to divise. I actually want to give a brief shout-out as well to the editing in the pilot, which is rather sharp from beginning to end. It keeps the pace quick and snappy, in rhythm with the dialogue, and allows for smaller, quieter moments when needed. More than anything, it's there to help the plot along and keep things interesting. The plot of the pilot is actually rather straightforward, and somewhat standard in terms of stakes and obstacles. The editing helps with some of this, not letting the episode sink into its own devices and instead matches it more to the dialogue and tone - a bit more peppy, and sharp. For example: Will's visit to Sue, where she breaks down the high school caste system, is intercut with Will's visit to Emma, who suggests trying to lure some of the popular kids into the club as Will cleans gum off the bottom of her shoe. Both scenes, independent of one another, are rather expository and could bog down the pace of the show when left to play out individually. But instead, they are cut together, and help the exposition stay quick so we can get to the good character stuff. And yes, the plot is a bit standard, and knowing where the show goes after this initial episode, it's easy to see that many same constructions are still in place - for better or for worse. Glee club always needs funding and is in danger of being shut down. 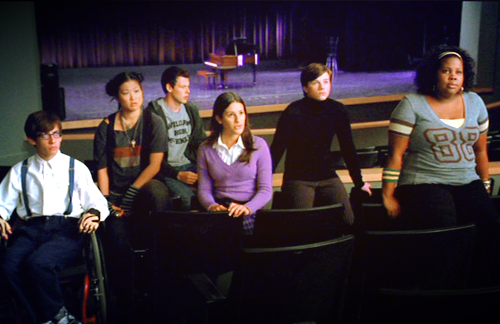 Finn has to decide between popularity and glee club. Will is trying to get his life in order. Sue's trying to take down the glee kids and keep the unpopular students in their place. Rachel is trying to be a part of something special, where people think she's special. But, in this first episode, everything works because it's the beginning. We don't know what this ragtag ensemble of misfits is capable of, but we're excited to go on the journey with them. What's great about Glee's pilot is not necessarily anything to do with the individual stories or even song choices, but rather the fact that it was practically radiant with potential. The best word I can think to describe this original shove into Glee's universe is verve. It was sharp, quick-witted, and still managed to find some real emotions underneath the irony. And in combining this tone with a classic underdog story, it's hard to watch the closing number - "Don't Stop Believing" and not feel a sense of magic. It's arguable that this magic has leaked away since then, but I defy anyone to watch those six misfit kids come together and claim the stage and not think it's the beginning of something extraordinary. Seriously. I may have to kidnap you and get you to write for me. Joking. You should be a critic and/or scriptwriter. Pleeeeassseeee?! This is a really, really great analyis of the pilot episode of Glee (and probably the best one I've read!) but there is one point I disagree with and I beg you here me out...in my opinion, Will is the main character and here's why I think so. Will is the one that took over New Directions. Without him, I think the club would have died because none of the other teachers seemed to care about and let's face it, Rachel will eventually graduate but even with this group of kids gone after graduation, Will will still be there guiding a new bunch of misfits.